Just like humans, some animals completely stand out from the rest of the members of their family. Take this cute Husky pup for instance. While his siblings were fast asleep, dreaming about milk and toys, this poor little pup looked restless and uneasy. It seems that this puppy isn’t suited for the litter life, he is looking for something much more different. Apparently, he aspires to be a Wookiee, as his greatest inspiration must be Chewbacca, one of the most popular Wookiees, which are, in the Star Wars Universe, a fictitious species of intelligent bipeds, inhabitants of the planet Kashyyyk. Wookiees are widely known for being a hairier, taller, and stronger version of humans and other humanoid species. But the interesting and ridiculous thing is that Chewbacca was actually based on a dog. As stated by George Lucas, the creator of the Star Wars and Indiana Jones franchises, his Alaskan Malamute was, in fact, the inspiration for the character.This little husky definitely has the Wookiee genes, as he has perfectly mastered his Wookiee howl. He sounds exactly like Chewbacca whenever he lets out a howl. All he needs to work on now is standing on two feet. Well, this may not be entirely true. 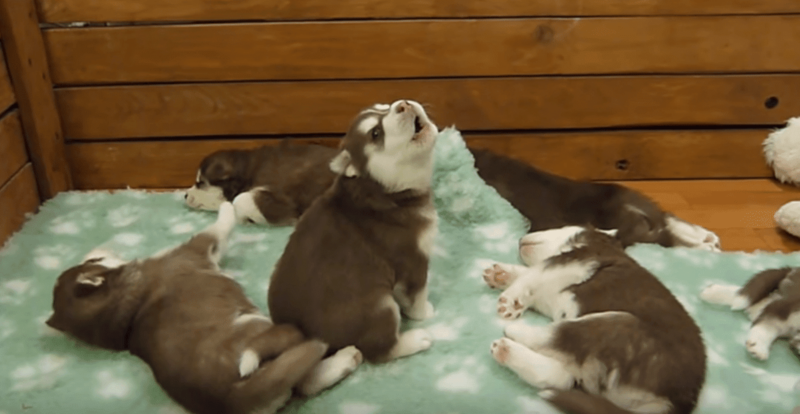 According to Husky Problems, the puppy might just be bored. Husky Problems explains that if boredom gets in your Husky’s way, it can cause them to howl; as if they are looking for attention or asking their owner to interact with them. There are other reasons why a Husky might howl.The website states that howling is obviously the way huskies use to communicate with each other in the wilderness. However, when they are being domesticated, the owner doesn’t want to see packs of huskies gathering around their home, but this doesn’t stop the huskies from howling, as this primitive trait never really leave him. Huskies might also start howling if they hear alarms of sirens going off in the middle of the night. The only way you can know the howling is not normal is if they keep it up even after the sound stops. By any means, the charming Chewbacca-wannabe has melted hearts all over the globe. A footage of him doing his special howl has been viewed more than 800,000 times on Youtube. Check out the video below to see this baby husky’s perfect impression of his idol Chewbacca.